A trend forward representation of rustic beauty merged with modern elegance, this tropical flower bouquet is a gift your recipient is sure to admire for its innovative design and combination of gorgeous blooms. 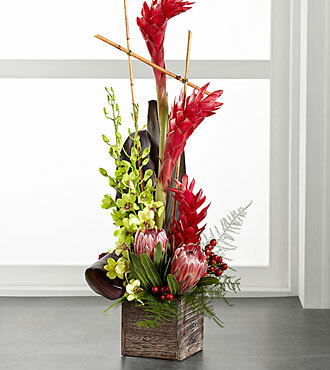 Red ginger stalks will catch their attention arranged amongst jade green dendrobium orchids, pink protea, red hypericum berries, red ti leaves, and fronds of plumosa. Presented in a rustic square wooden planter to give it that sophisticated edge, this tropical flower arrangement is set to create a memorable thank you, birthday, or thinking of you gift.